Kenya’s Henry Kirwa failed in his bid to regain the 1500m T13 gold as he settled for bronze in Sunday’s final won by Algerian. Kirwa, the triple Olympic champion from Beijing after winning the 1500, 5000 and 10000m timed 3:49.59 behind Algerian Abdelatiff Baka who race to a world record of 3:48.29.Ethiopian Tamiru Demisse won silver in 3:48.59,which was within the world record time of 3:48.84 set by Kenyan David Korir in 2012. 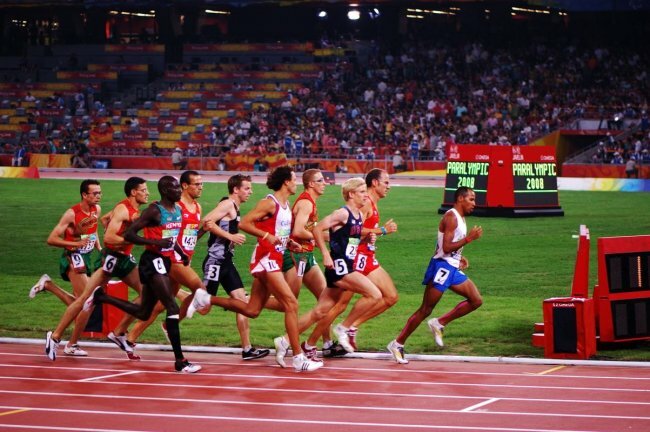 Korir had opted to race from the back of the packed field of visually impaired athletes before slowly edging forward in a race dominated by the Brazilian duo of Agripino Dos Santos, who lost his footing after tripping with a about 700m to go, and Yeltsin Jacuqes. But the Africans well timed kick counted as they raced forward to the bell with Baka taking charge at the last bend with the Ethiopian who chose to celebrate his country’s first medal at the games in Rio with the Oromia protest sign at the finish line quickly closing in for the silver. A tiring Kirwa didn’t push further and was lucky to hang on for third ahead of Baka’s twi Foaud who finished fourth in 3:49.84. Samwel Muchai showed his intent to win another gold in Rio, qualifying top from his T11 1500m on Sunday racing to 4:04.50 his season best ahead of Odair Santos the Brazilian who set the pace until the last 300m when the Kenyan too charge till the end. Santos who times 4:05.34. The Brazilian won silver in the 5000m which Mushai won and his compatriot Wilson Bii clinched bronze. Bii also qualified for Tuesday’s final first in a slowed 4:13.20.